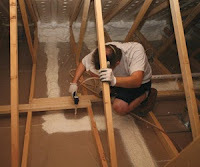 Save Money By Air Sealing This Spring! Many air leaks and drafts are easy to find because they are easy to feel – like those around windows and doors. But holes hidden in attics, basements, and crawlspaces are usually bigger problems. Sealing these leaks with caulk, spray foam, or weather stripping will have a great impact on improving your comfort and reducing utility bills. Contact us for a free air sealing estimate today! Author adminPosted on March 23, 2016 October 3, 2018 Categories air sealing, eliminate stink bugs, keep your home cool, stop energy lossLeave a comment on Save Money By Air Sealing This Spring!